A tiny amount of physical exercise, which is too modest to increase muscle mass and reduce fat mass, improves physical exercise in combination with ursolic acid supplementation. South Korean sport scientists at Chonbuk National University, who were experimenting with rats, discovered this. The researchers made it impossible for their lab rats to use their hind legs for 8 days, causing the muscles to break down. Then the actual experiment started, which lasted 8 weeks. Some of the rats were given a daily dose of ursolic acid. [UA] The human equivalent of that dose was about 100-150 milligrams of ursolic acid per day. There are supplements on the market that deliver such quantities. Another group of animals went jogging for a quarter of an hour on a treadmill three times a week. [EX] The intensity was moderate: the animals ran at 45-55 percent of their VO2max. The combination of the modest endurance training and supplementation with ursolic acid resulted in an increase in the muscle mass of the tibialis anterior and the gastrocnemius [GAS]. The combination had no effect on the soleus [SOL]. When the researchers studied the muscle cells of the test animals, they saw that ursolic acid in combination with exercise did not increase the activity of anabolic signaling molecules such as mTOR and Akt, but reduced the activity of catabolic signaling molecules such as MuRF1 and Atrogin-1. 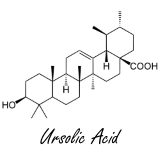 The combination of ursolic acid and the modest training finally reduced the fat mass in the abdomen. "In conclusion, this study analyzed the effects of concurrent treatment with ursolic acid and low-intensity treadmill exercise to improve skeletal muscle atrophy using an animal model", summarize the Koreans. "The effect of ursolic acid alone on muscle atrophy could not be confirmed; however, positive effects could be confirmed for ursolic acid combined with low-intensity endurance exercise." "Further studies will be needed to verify the differences in concentration of ursolic acid and need to additionally analyze the relevant signaling pathway to confirm a mechanism for use of ursolic acid as an exercise mimetic." "This study is meaningful in that ursolic acid was identified to have a possible use as an exercise mimetic for reduction of [...] visceral fat mass and inhibition of muscle atrophy." Korean J Physiol Pharmacol. 2018 Jul;22(4):427-36. A high intake of carotenoids as beta-carotene may protect against muscle breakdown, according to this Japanese animal study. Supplements containing the quercetin analogue EMIQ speed up muscle growth in strength training and rehabilitation programmes. Animal data.